Startups thriving in the US must adapt to a new healthcare system and intellectual property regulations to operate in the Chinese market. Sally Liang speaks at the US-China Summit. All photos credit of USHC. With a population of over 1.4 billion people or roughly 18.5 percent of the world’s people, China appears a ripe market for healthcare startups. The country also struggles with many of the same healthcare challenges as the West, including an aging population and a growing number of people living with diabetes. But for Western digital health companies looking to start in China, numerous obstacles exist, including protecting intellectual property, finding investors, and navigating the local government and politics. 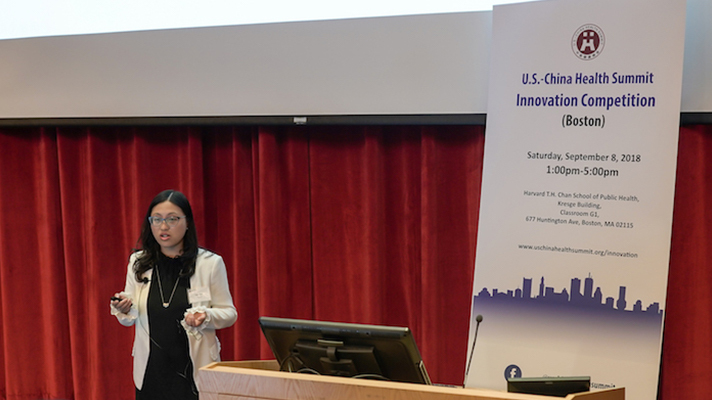 Mou has been working with the US--China Health Summit, a Harvard University affiliated program, which includes a startup competition (the US--China Health Summit Innovation Competition) that helps link Western health innovators to Chinese resources. The connections include government officials and large hospitals, with some of the countries’ largest hospital CEOs judging the competition. His company, Valera Health, which uses digital tools to address mental health, won the competition in 2016. The summit originated during the SARS epidemic, with the goal of bringing ideas from both the US and China together. Now the program is targeted towards healthcare startups that are doing well in the US and looking to explore the Chinese market but need support entering the space. A parallel competition also takes place China to bring Chinese entrepreneurs to the US. One of this year’s winners was Breegi Scientific, a connected care company that makes disposable low-cost incubators which digitally collect information on the baby inside and can send that data to providers. The company has been looking to the Chinese market for sometime. The founder cited the need for his product in the area and the availability of manufacturing sites to produce it. In fact, it has already been creating an infrastructure in the local area. Breegi noted that making personal connections is essential for starting in the country. “What is interesting about the Chinese market is if you have the support of the government, especially with an important project like this, you would be able to cut the cost dramatically,” Dr. Wisam Breegi, founder and CEO of Breegi Scientific, told MobiHealthNews. Breegi said he decided the company should compete in the summit to further its connections in the Chinese market. Since winning the competition a few years ago, Valera Health’s Dr. Mou said he’s already had talks with major Chinese companies including Ping An and Alibaba, in addition to meeting with local officials. The summit has also led to other connections. For example Massachusetts General Hospital, where Mou is a physician, has been able to team up with hospitals in China to bring them its digital education tools. Both Mou and Breegi noted that the large population creates new opportunities for health innovation. For example, when Mou was talking to the governor of Sichuan, a physician by training, he discovered the providence had over 80 million people—larger than most European countries. But navigating a new healthcare system and intellectual property regulations can be difficult waters. Sally Liang, CEO of a nutrition-focused digital health startup still in stealth mode, a specialist in US-China relations, and a competitor at the US-China Health Summit, told MobiHealthNews that companies looking to start out in China have to face some difficult questions. As we’ve seen with many of the major US tech companies, privacy and censorship have been major concerns. Liang suggested working with local entities as a way to help navigate the system. It’s not only regulation that can be challenging but wading through cultural differences and value systems. This could create some challenges for digital health companies, which provide care virtually. However, those like Mou and Breegi who have started to explore the Chinese market waters have found that opening the channels of communication are key. They also note that the Chinese government has kicked off Healthy China 2030, the country’s first long term strategic health plan since 1949. This means there is now a government mandate that makes healthcare policy a priority. This could provide opportunities for companies looking to enter the market.